and striking graphics compliment each other to create a bat ideal for shots all around the wicket in every format of the game. Kookaburra’s Flat Face Profile levels out the striking area allowing more mass to be retained in the back and edges of the bat. By maximising the amount of willow behind the striking area, the bat gains a larger profile and produces more power. 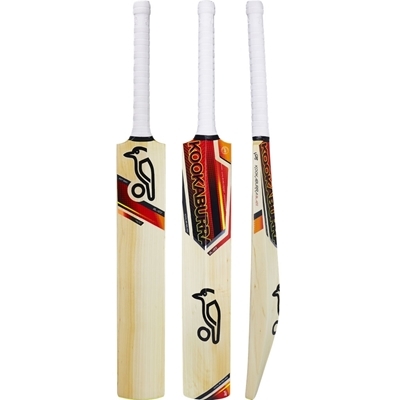 The Iconic Kahuna cricket bat has been the spearhead of the Kookaburra range for the last 13 years and is the classic Kookaburra bat shape. It's powerful profile, big edges and world renowned graphics make it ideal for the stroke maker who likes to take control and lead by example. All Kookaburra new range for 2016 Cricket Eyewear is classified as Category 3 which prevents 82% to 92% of the suns glare & as such provides excellent UV protection. Kookaburra Eyewear is without doubt the sensible choice for the fashion & safety conscious Cricketer. Kookaburra Catalyst Sunglasses are classically designed cricket eye wear with the option to change the lenses from "Blue Revo" when it is sunny to "Light Enhancing Orange" for when the sun goes in behind the clouds.